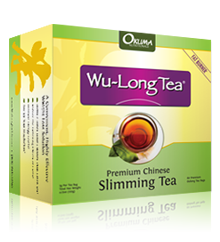 If you've ever wanted a convenient way to boost your metabolism, automatically burn more calories, and start shedding fat faster, then look no further than Okuma's authentic Wu-Long Tea, the World's #1 Fat-Burning Diet Tea. I first came across Wu-Long Tea. This particular study was conducted by scientists from Japan's University of Tokushima School of Medicine and published in the Journal of Medical Investigation. What's more, the CBS Evening News reported, "Polyphenols in Wu Long Tea are believed to increase energy expenditure (EE) translating to a 35-43% increase in fat burning*"
Only a Small Part of the Benefits of Drinking Wu-Long Tea! For instance, let me tell you about a fascinating study scientists conducted at the Suntory Research Center in Osaka, Japan. They decided to study the effects of Wu-Long Tea on the absorption of carbohydrates. As you probably know, eating a lot of carbs all at once can cause your blood sugar to spike. And when your blood sugar spikes, an insulin spike is sure to follow. If your pancreas releases too much insulin (which is a common problem for a lot of folks), you'll then experience low blood sugar. And, when your blood sugar drops, you may feel the urge to eat even more carbs! And thus begins a pattern of MORE eating, MORE insulin, MORE low blood sugar, and on and on in a vicious cycle that can "pile on" the fat. I've experienced this "roller coaster" myself, and it's no fun! But what if Wu-Long Tea could help break this cycle? That's what the Japanese scientists set out to discover. And they were not disappointed. Here's what they found: Drinking Okuma's premium Wu-Long Tea 15 minutes before eating carbohydrates helps to reduce the insulin spike you would normally experience after eating carbs. Wu-Long Tea Helps Curb Cravings 2 Ways! First, drinking Wu-Long Tea 15 minutes before meals helps eliminate "carb cravings" by regulating insulin spikes - which solves a big problem for a lot of overweight people*. And second, drinking Wu-Long Tea in between meals will make you feel full and content, which will help you avoid unhealthy mid-day snacking. This is why so many people finally start to see their weight dropping when they start drinking Okuma's Wu-Long Tea. They're naturally burning more calories (because Wu-Long raises metabolism)… AND … they're eating fewer calories (because Wu-Long helps to moderate unhealthy cravings). For optimum results, we recommend that you use our products in combination with a healthy diet, drink plenty of water and also get regular exercise. This will help to create optimum results. Check out the Okuma blog for more information on this AMAZING Wu-Long tea and tips and tricks for a healthy lifestyle. We get our Wu-Long Tea straight from Anxi County in the Fujian Province of China. Because Anxi is known as the Tea Capital of China. They grow some of the highest quality tea in the world. What's more, this particular place is famous for its specific variety of Wu-Long Tea! Every time you drink a cup of Okuma's Wu-Long Tea, you can be 100% confident that you're getting high-quality Wu-Long Tea… without any fillers. Free radicals have been linked to signs of aging, including wrinkles, skin blemishes, and even cancer. Fortunately, Wu-Long Tea significantly reduces free radicals in the body and helps slow down (and even reverse) signs of aging. In fact, in a 2004 study conducted by Dr. Kenichi Yanagimoto and colleagues from the University of California, Davis, it was found that people who drank Wu-Long Tea daily experienced a remarkable 50 percent reduction in free radicals within just 15 days! A new study from the Department of Dentistry at Japan's Osaka University shows the regular consumption of Wu-Long Tea strengthens teeth and helps prevent tooth decay by significantly inhibiting plaque build-up. Perhaps the most notable testament to the power of Wu-Long comes from the esteemed Chinese pharmaceutical book Bencao Shiyi (The Compendium of Materia Medica), which says the tea "will make one live long and stay in good shape." And Kiss Your Belly Fat Goodbye! What happens if you leave this page and continue on with your day? You'll probably continue about your business and fail to make the changes you need to make to start losing weight. Please don't let that happen. Go ahead and click the button below to get your Wu-Long Tea now. Begin enjoying the tea in the comfort of your own home. See how effective it is at boosting metabolism, burning fat, and curbing cravings. Remember: There's no risk to you at all because you're protected by our 100% Satisfaction Guarantee. We will gladly refund you if you're not thrilled with your decision to try our tea. I strongly encourage you to try Okuma's Original Wu-Long Tea today. It's one of the best things you could do for your overall health and well-being. So please take the first step right now by clicking on the button below. On the next page you'll be able to select the tea you want. P.S. Since we opened our doors and began selling Wu-Long Tea in 1998, we've shipped more than 4 Million boxes of tea to more than 700,000 satisfied, slimmer customers. 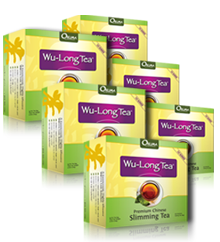 Click Here to order your Wu-Long Tea Today! 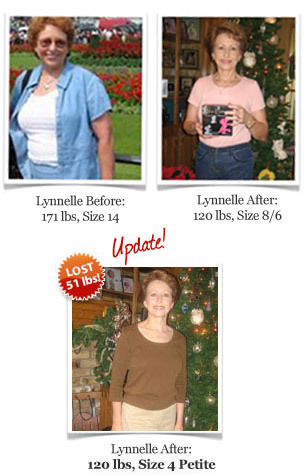 Real People Experiencing Amazing Results! After the birth of my daughter I found it very difficult to loose the weight I gained during my pregnancy. I was miserable because I had never been overweight and just wanted the weight off. So I decided to go online and research a fast, safe and effective weight loss supplement and Okuma's website came up and I was immediately intrigued. After reading the extensive information I found on Okuma's website, I decided I had nothing to loose except the unwanted extra pounds that I had gained. Needless to say, after only 6 short months of taking 2 cups a day of Okuma's Wu-Long Tea along with light exercise and a healthy diet I have lost 37 pounds. I have never felt better! The tea is just amazing! Of course the reason why I had bought it initially was to loose weight but now I continue to purchase it just to maintain my weight loss, to maintain a healthy immune system, and for all the other amazing health benefits Okuma Wu-Long Tea has to offer. Thank you Okuma for discovering Okuma's Wu-Long Tea! I will forever be your customer. Almost one year ago, I could barely squeeze into a size 14 skirt and top by wearing a hot and very uncomfortable spandex body slimmer! By August, it was too tight to wear at all, and I decided something had to be done. I noticed an article on a local TV station's web site about slimming tea. It caught my attention and sounded very promising, so I ordered my first box of Okuma's Wu-Long Tea. I began drinking two cups a day and began to lose about one pound every week. I consistently lost an average of 4-5 lbs a month totaling a loss today of slightly more than 40 lbs. I have gone from 171 lbs down to 127 lbs without sacrificing anything! I am thrilled to be replacing my wardrobe with 6's & 8's instead of those 14's. The beauty of it is that I have done nothing else besides drink one cup every morning and one cup every night. I have continued eating my favorite foods such as chocolate, pizza, burgers, etc., but am now satisfied with slightly smaller portions. I also feel much better, have more energy, and no longer crave those in-between-meal snacks. Everywhere I go people who knew me as 40 lbs heavier are asking me what I am doing to lose all this weight. I tell them I am drinking Okuma's Premium Chinese Slimming Tea! "I have lost weight over the last 2 years, but that hasn’t been the biggest advantage. Feeling good, having youthful skin ( at the age of 59), and not feeling fatigue at the end of a long day of work have all been the greatest advantages of Wu-Long Tea. I’ve tried the capsules, which are great too, but I really enjoy the taste of the tea. Your company has also been great about offering specials to regular customers. I even got one of my co- workers hooked on your tea this past year!" "I have had cystic acne since I was 13 years old (I’m now 49) and I’ve had to be on antibiotics all this time. Since I started drinking the tea I have not taken a single antibiotic and my skin is free and clear (once in awhile a little something but never like it used to be)." "I really am pleased with this product. 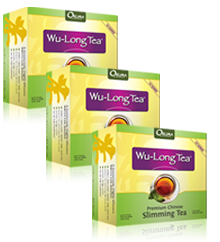 I have tried all kinds of weight loss, pills, drinks and patches but nothing worked until the Wu-Long Tea. I am 75 years old and not extremely overweight but would like to loose at least 20lbs. Am on the way thanks to the tea." "So far, since I started my lifestyle changes, I have lost 37 pounds, several inches, and have gone from a size 18 to a size 12. I am a happier, healthier, more satisfied woman, and I look forward to continuing this until the day the Good Lord decides I’ve been here long enough!" 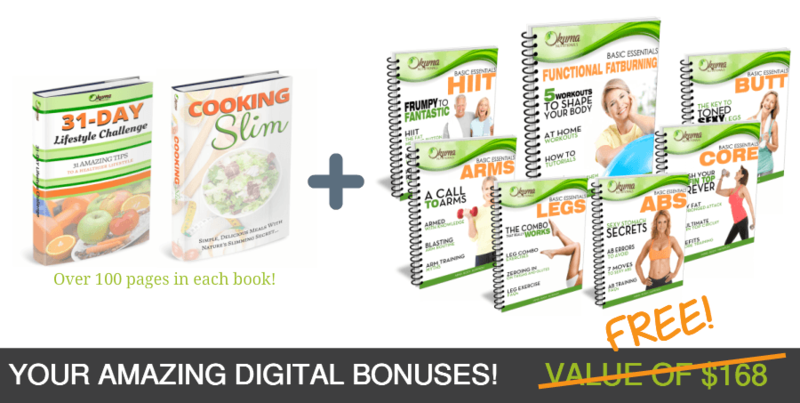 Our first bonus to you is our amazing cookbook - "Cooking Slim". Cooking Slim gives you 60 healthy and delicious recipes that you can whip up in minutes. What's more -- these recipes are specifically designed to amplify the fat-fighting polyphenols in Wu-Long. They help give your metabolism an extra turbo-boost accelerating your fat loss even further. The Body of your dreams starts in your mind. With the Wu-Long 31-Day Challenge companion guide, you will find daily challenges to help you create the small but crucial habits needed to get Slim, and STAY Slim! Your brain believes what you say. So learn the tricks to speak SLIM into your life today! Unlike long cardio, these short, 15-20 minute workouts flood your body with hormones that trigger your body's "rapid fat burning response". Researchers in one study found that doing these workouts while taking Wu-Long can increase fat loss by up to 17%! They're a perfect complement to the fat-burning power of Wu-Long. Order Your Wu-Long Tea Today! This 1 month package will get you started on the path to success and will secure your VIP discount on all future purchases. Enjoy the amazing benefits of Okuma's most popular premium Wu-Long Tea package while securing your VIP discount on all future purchases. Our highest-powered weight loss VIP package for the dieter determined to reach their goals using nature's most effective, all natural weight loss solution. Secure your discount with all future orders. VIP is our convenient auto-ship program that sends your discounted Oolong Tea on an auto-ship schedule - cancel anytime. Answer: When to Use Wu-Long - We recommend drinking one cup of tea in the morning 15 minutes before a healthy breakfast, and then again about 15 minutes before a healthy lunch. It is important to know that our tea products will be most effective when used in combination with a healthy diet and exercise program. While some may enjoy a cup in the evening or with the dinner meal, those who are sensitive to caffeine should be advised that the tea does contain some caffeine. Answer: Our products are all grown at high altitudes in the WuYi Mountains of China by highly trained tea farmers. 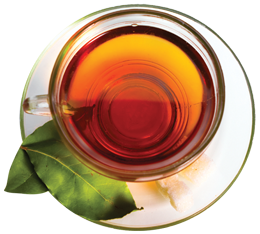 Our tea products contain NO pesticides, NO fillers, NO artificial flavorings/colors, NO corn or soy & NO GMOs. It is simply 1 AMAZING ingredient – 100% Oolong Tea Leaves. Our tea products help to rev up metabolism, boost immune system, slow down the aging process, fight acne, lower cholesterol, regulate insulin spikes, fight diseases and cancer, boost energy levels and promote healthy teeth and bones. Our products contain high amounts of catechins and polyphenols (antioxidants), which help to keep your body healthy and fight free radicals, which cause aging and disease in the body. The high amounts of EGCG in our tea and capsules boost the metabolism resulting in weight loss over time. But we ship all over the world, with priority shipping using United Parcel Service (UPS) and the USPS Priority International. This way, it doesn't matter where you are. We'll bring our Wu-Long to you! What is the VIP Loyalty Program? Answer: Products purchased under our VIP / Loyalty Program offers come with significant discounts that are locked in for the lifetime of your Membership, as long as it remains active. Recurring shipments are sent out based on how much product you initially order. Ex: A 2 month supply will reship every 2 months. Loyalty membership can be modified at any time by contacting us at Support@OkumaNutritionals.com. Regular price of a 30 day supply of tea is $47. Answer: Wu-Long is made of 100% all natural, pure oolong tea, with NO fillers and NO preservatives. It is also Certified Organic. It contains NO sugar and NO artificial sweeteners, flavors or colors. Also, there is a moderate amount of naturally occurring caffeine in oolong tea. The amount of caffeine is equivalent to 1/3 of a cup of coffee (3 cups of coffee = 1 cup of oolong tea). If you have sensitivities to caffeine, we recommend consulting your doctor. Is It Save To Order Online From Your Website? The CBS Evening News reported, "Polyphenols in Wu-Long are believed to increase energy expenditure (EE) translating to a 35-43' increase in fat burning." Polyphenols are nature's powerful antioxidants that are found in abundance in Wu-Long. In fact, Scientists from Japan's University of Tokushima School of Medicine discovered that people who regularly consumed Wu-Long experienced more than double the calorie-burning results of those who drank the same amount of authentic Japanese green tea. Finally, The Suntory Research Center in Osaka, Japan, discovered that drinking Wu-Long 15 minutes before eating carbohydrates helps to eliminate cravings by reducing the insulin spike you would normally experience after eating carbs. *These statements have not been evaluated by the FDA. These products are not intended to diagnose, treat, cure, or prevent any disease. Results may vary.